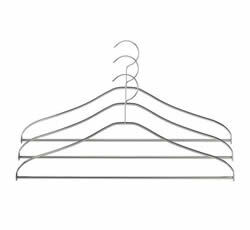 Shandong Xingying International Trading Co., Ltd. is specializing in manufacturing and selling wire hangers that providing perfect solutions for storing clothes, especially the garments which are prone to slip or deform on standard hangers. 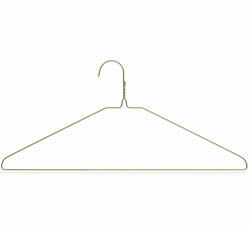 Our company is engaged in manufacturing wire hangers over 15 years, and we supply a range of high quality hangers in a wide variety of types and sizes. 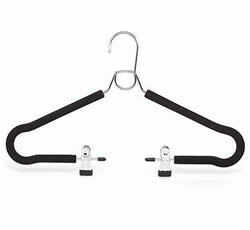 What type of hangers our company can supply? It is a perfect combination of sturdy chrome finished construction and high quality PVC coating. It is anti-rust, non-slip and it can maintain the great shapes of your garments and maximum your storage space. Additionally, the PVC coating has rich dipped colors for coordinating different color clothing according to your taste. The foam hanger we supply is made of chrome plated construction and high quality foam. The chrome coating makes it anti-rust and the cushy foam prevents the garments from slipping, creasing and deforming. So it is perfect for bulky and delicate garments. Furthermore, the foam has variety of colors to decorate your closet and wardrobe. The wire hanger supplied by our company can be made in different materials, such as iron, steel and stainless stain. As we know, stainless steel hanger does not readily corrode, rust or stain with water, so it wons great acknowledgment from clients. In order to enhance the corrosion resistance of the iron and steel hangers, we plate metal coating such as chrome, nickle, zinc and so on. After plating, it gets elegant appearance and rust-resistance. Due to its sturdy construction and low price, it is also widely used and acknowledged. The galvanized hangers we supply are not only durable and well-constructed, but also anti-rust and high temperature resistent. Most of all, they are cheaper than any other wire hangers. According to its high quality and low price, it is widely used in laundries all over the world. Aluminum hanger features its light-weight and abrasion resistance. Additionally, they are stainless and durable. We are manufacturer and can provide competitive price. We can give our clients 100% guaranteed quality. 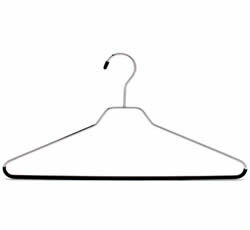 We offer variety types, sizes, colors of hangers to meet your needs. We still can give our clients special suggestion and still can design unique hanger for our clients. If your need any advice about wire hangers or have some questions to inquire, please contact us now hanger@wirehanger.org. We are looking forward to answering the questions you might have. PVC coated hangers are perfect combinations of anti-rust wire and PVC coating. They have various colors and keep garments free of slipping and denting. Foam hangers are perfect combinations of anti-rust wire and cushy foam. The foam has various colors and keep garments free of slipping and denting. Galvanized hangers are durable, well-constructed, anti-rust and high temperature resistent. Its low price and high quality allow it widely be used in laundries.